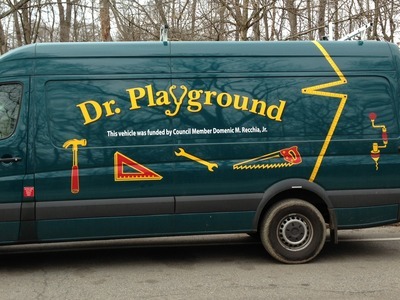 "This vehicle was funded by Council Member Domenic M. Recchia, Jr." reads the lettering on the side of a New York City Parks Department "Dr. Playground" van. "Funded by Council Member Domenic M. Recchia, Jr."
Actually, the van was funded by the people of the City of New York, whose money was taken from them through force by taxation and then spent by the Council member. It's a distinction that may be too fine for the Parks Department or for the Council Member, but one that matters to at least some New Yorkers, who when they see such congratulation of politicians for spending taxpayer money may find themselves less inclined to vote for the politician being congratulated.